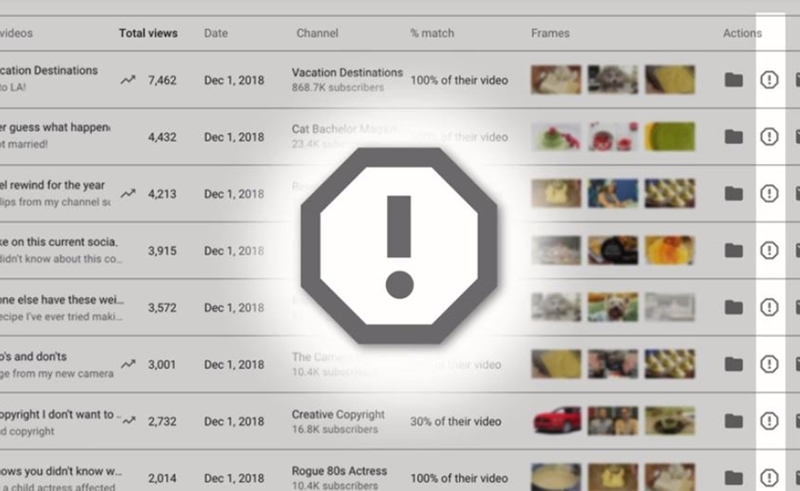 In May, YouTube shared that it was testing a feature called Copyright Match — an abbreviated version of its Content ID tool, which can detect identical video reuploads and then enable rights holders to take certain actions. Next week, Copyright Match will become available to creators with more than 100,000 subscribers, Variety reports. The feature has been in the works for roughly a year. “We know how frustrating it is when your content is uploaded to other channels without your permission, and how time-consuming it can be to manually search for these re-uploads,” Fabio Magagna, who serves as product manager for Copyright Match, tells Variety. Upon detecting a reupload, Copyright Match offers creators three options: to leave up the offending video, contact the creator in question, or request that YouTube take it down. That said, Copyright Match is far less sophisticated than YouTube’s seminal Content ID tool — even though they both use similar matching technology, according to Magagna. Content ID offers more sophisticated features — including the ability for rights holders to monetize and/or track the analytics of infringing works. Furthermore, Copyright Match is intended to nab identical video-for-video reuploads, while Content ID can detect audio or video infringement occurring within a shorter segment of a clip.